Each bedroom has its own custom en suite bathroom with antique touches and private deck overlooking the river, mountains or both. 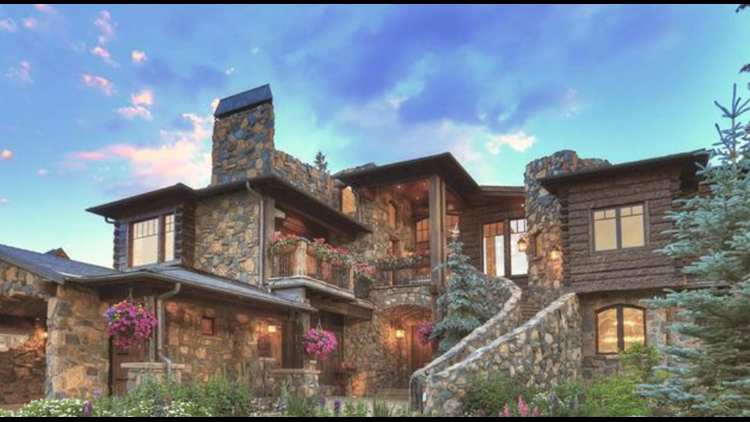 DENVER BUSINESS JOURNAL — From the outside, this home just minutes away from Breckenridge Ski Resort looks like a rustic castle — and it's even called "Castle on the Blue." That name refers to it's location — right on the banks of the Blue River, which winds past the home. The European-style estate was built in 2009 with large river rock and locally hand-hewn squared timber logs and beams, according to the listing. It has five bedrooms and seven bathrooms across its 9,025 square feet, wrapped around a floor-to-ceiling double fireplace and a gourmet kitchen. New-world features of the home include a movie theater, a glass elevator and smart-home technology throughout.